Thanks to yet another cool, damp June—the new normal for our region?—the moss rose outside my kitchen window has been putting on a lovely show for the past several weeks. I’m never satisfied just looking at the pillowy pink flowers, burst from inconceivably slender mossy buds, and inhaling their delicious scent. I have to eat them, too. So a couple of weeks ago I put up several pints of strawberry-rose jam and thought, What next? My rhubarb plants had been drinking up the rain and growing monstrous. Last year I combined roses and rhubarb with strawberries in a heavenly jam. 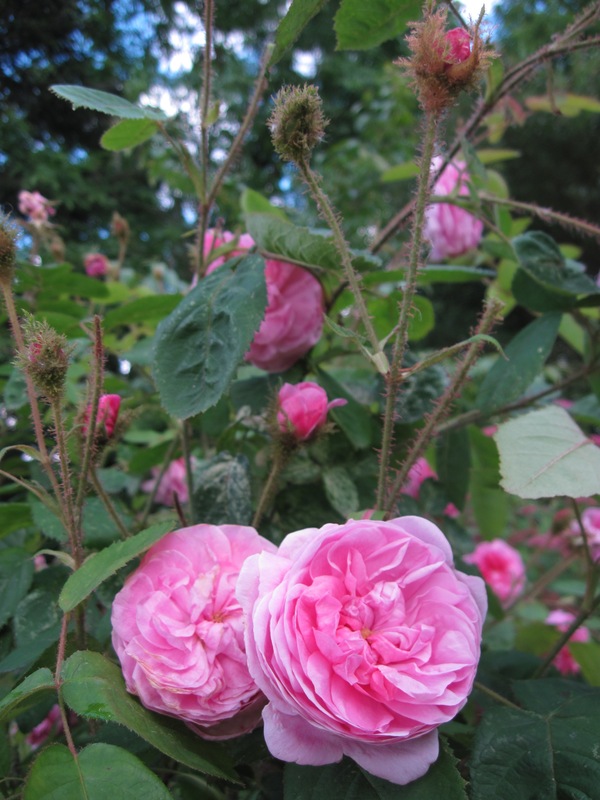 Now I wondered how rhubarb and roses would work as a duo. I considered a recipe I’d jotted down from Margaret Rudkin’s old Pepperidge Farm Cookbook. All my life I’ve been eating rhubarb sauce made on the stovetop. 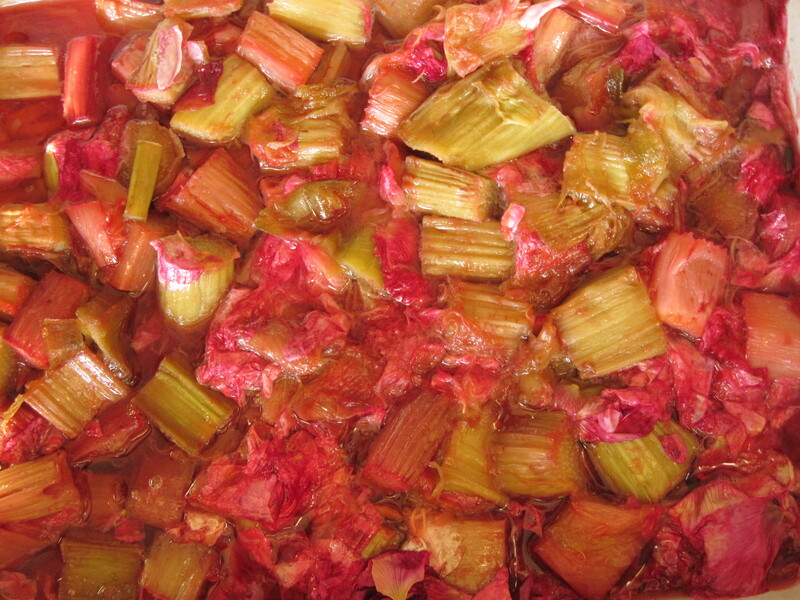 Sauce is the right word for the stuff, because rhubarb breaks down with brief boiling to a greenish, reddish, fibrous mush. As a child I loved this springtime alternative to applesauce. But rhubarb sauce, as I’d always known it, was ugly. Margaret cooked her rhubarb in the oven, she wrote, and the pieces stayed handsomely intact. With the addition of pink or red roses, maybe I could both improve the color of the rhubarb and make the flavor more interesting. And why not can the result to enjoy months later? So I created the recipe that follows. The roses intensify the red of the rhubarb without disguising the green, and the rosy scent balances the sour and sweet tastes. Served on pound cake or sponge cake, baked rhubarb with rose petals looks nearly as elegant as it tastes and smells. Preheat the oven to 350 degrees F. Combine the rhubarb pieces and sugar in a baking dish, and put the dish into the hot oven. After 30 minutes, add the rose petals, and turn the mixture gently. Bake about 15 minutes more, until the rhubarb is tender but still intact. Spoon the mixture into hot mason jars, leaving ½ inch headspace. Be sure to run a chopstick or plastic stick around the inner surface of the jar to free trapped air. Process the jars in a boiling-water bath for 15 minutes. This entry was posted in Fruits, Sweet preserves and tagged canning, cooking with roses, moss rose, preserves, recipe, rhubarb, roses. Bookmark the permalink. Linda, such a glorious colour. I wait for next years crop; it’s mid winter now. Elaine, thanks for reading a blog in which everything is upside-down and backwards. Yes too true! However you post the most wonderful jam recipes. I have my autumn crop of strawberries in the freezer, just waiting to be made into a lovely jam. What a beautiful color that turns out. Just pretty to look at! I am amazed at the things you come up with, especially water bathing the roasted rhubarb! Thanks. I make a lot of jams and am always looking for new and interesting recipes. This one just blows me away! Can’t wait to try it. Thanks! Gorgeous, and what a unique combination! I can’t really imagine what the flavors would be like – does the rhubarb overpower the rose? The rose really does come through strong, Martine, because although rhubarb has a strong taste it doesn’t have much fragrance. Did your jam set well? Mine is a bit more liquidly than I expected. Will be fine on oatmeal but not so good on toast. Preserves are supposed to be syrupy. 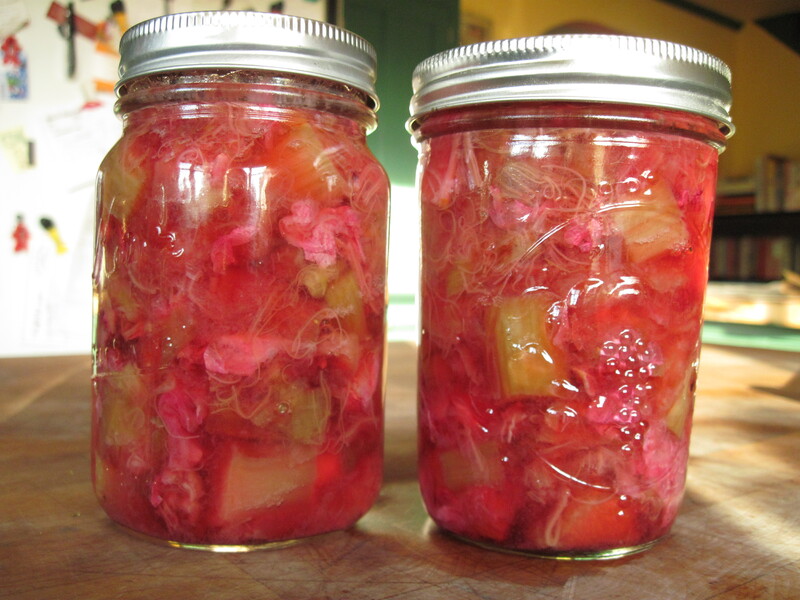 With pectin-rich fruits the syrup often jells, but this doesn’t happen with rhubarb. Still, my preserves turned out pretty thick. You might have been happier with yours if they had had just a few more minutes’ cooking.